The artistic beauty of buildings depends on very definite means: forms, proportions, material, color, and many other factors. Our special task here is to look at these in detail, but we wish to emphasize explicitly that it is not our intention to indicate rules for the application of these means, rules that would guarantee the artistic value of a building if they were observed. That is not the task of aesthetics, where the situation is completely different than in logic and in ethics. In logic Aristotle established rules for the syllogism, and a flawless conclusion is guaranteed if these are observed. In ethics one can lay down norms that guarantee the moral value of an action. This is not possible in aesthetics. The beauty of a building, of a picture, of a statue, of a poem, or of a melody is grounded in the special inspiration of the artist. He is entrusted with a mystery that cannot be formulated in a norm in such a way that the artist’s only task would be to fulfill that norm. . . . It may perhaps be possible to formulate some reasons for the aesthetic disvalue of a building. The failure to fulfill certain conditions may impair a work of art. But the avoidance of these mistakes does not guarantee artistic beauty . . . It is sometimes asserted that a building is beautiful if it does full justice to the concrete reality that it serves and if it fulfills all the requirements that are demanded by this theme or are indispensable if this theme is to be realized. Those who make such a claim usually have purely practical purposes in mind and affirm that the value of a building depends on how perfect it is under the aspect of achieving this practical purpose. This theory reduces architecture to a mere object of civilization. At the same time, however, it maintains that civilizational perfection also grounds the artistic beauty. 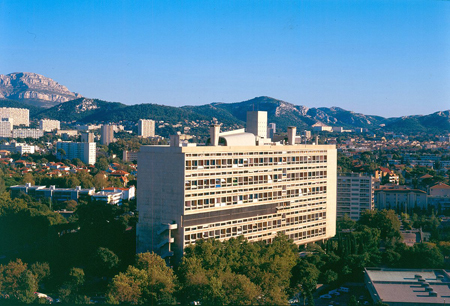 This functionalism, which found its chief representative in Le Corbusier, is mistaken on many counts. The artistic beauty of a building is not in the least a consequence of its perfect functionality. Principles of a purely artistic kind are decisive for the aesthetic value of a building. 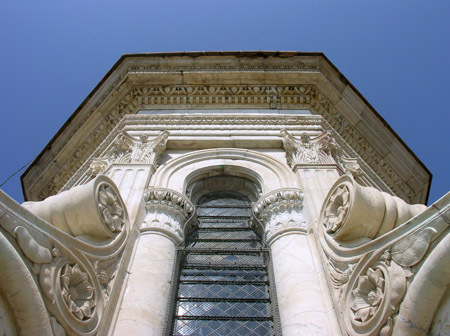 What beauty an arch can possess, or a tower in its form and color, such as the campanile of the cathedral in Florence or the tower on Saint Mark’s Square in Venice! What could it mean to say that the unique beauty of the cupola of Santa Maria del Fiore in Florence is based on the perfect fulfillment of its practical purpose? All we wish to do here is to point out the absurdity of this theory, which confuses artistic beauty with purely technical perfection and reduces the various expressive possibilities of architecture—this world of greatness and beauty—to mere functionality, asserting that the aesthetic value of a building is determined by its functionality. We cannot emphasize strongly enough that the fulfillment of these practical requirements has no influence on the second main theme, namely, beauty, or the artistic theme. Even if all the practical requirements are satisfied with the greatest perfection, the building can be deadly, ugly, or boring. As long as we are speaking of the perfection of purely practical purposes, there is a very loose connection with artistic beauty. From the perspective of the practical requirements of daily life, a farmhouse in Tuscany, which is very beautiful thanks to its noble proportions, the material employed, its color, the visible nobility and the poetry of its inner spaces, is certainly not . . . built in such a way that it facilitates all the practical functions of everyday life, nor is it ideal from a hygienic point of view. On the other hand, a modern building that fulfills all the practical requirements and is perfect with respect to civilization is usually a wretched construction from the artistic point of view. It almost always radiates an anonymous barrenness, a depressing prosaic character. It is true that it does not possess the triviality and pseudo-beauty of many houses from the second half of the nineteenth century, which are tasteless imitations of Gothic architecture. But its absolute barrenness, anonymity, and soullessness, and the lack of any charm whatever, form an antithesis to artistic beauty that is just as great as the trivial. If a building serves spiritual purposes, there exists a deep connection between its real theme and its artistic beauty. This is presupposed for the sake of doing justice to the spiritual purpose. The design of the building must also do justice to the genius of the spiritual purpose. A church should have a specifically sacred character. It is not enough for it to be a beautiful hall that presents the external aspect of a splendid palace. An essential element of the artistic value of a church is the atmosphere of the sacred, of consecration, of greatness, and of seriousness, all achieved by means of artistic factors. In this case it is certainly correct to hold that the artistic beauty cannot be detached from the real spiritual theme of the church, and that in addition to general artistic conditions, the special character of the house of God must also be realized—but with artistic means. In the case of a church, it is also meaningless to say: “Satisfy the requirements of the real spiritual theme, and then it is also artistically valuable.” This is because if one is to do justice to this theme, one must do so by means of artistic beauty. The general architectural beauty is presupposed; but we also need the artistic means by which the specifically sacred theme is realized. In the case of a church, the assertion “Satisfy the requirements of the real theme, and then the building is beautiful” would entail a vicious circle, because the real spiritual requirements are fulfilled only through the general artistic beauty and through the special artistic creation of the sacred atmosphere. It is only by means of artistic factors that a building can realize the true character of a church. The extent to which the artist himself is aware of this has no importance. He may be thinking only of the sacred theme and may wish to serve this theme alone, but if he is a true master builder and truly intends the church to be a sacred space, he will instinctively employ those artistic means that alone are able to realize this goal. Where the spiritual purpose is much more indirectly linked to buildings than is the case with a church—for example, in a theater or a concert hall—its beauty is more independent of its spiritual purpose and is conditioned more strongly by the general bearers of beauty in architecture. Naturally, the beauty of a theater such as the theater of classical antiquity or the Teatro Olimpico of Palladio in Vicenza or the Cuvilliés Theater in the Residence in Munich implies a completely different task than the beauty of a residential house or a palace. 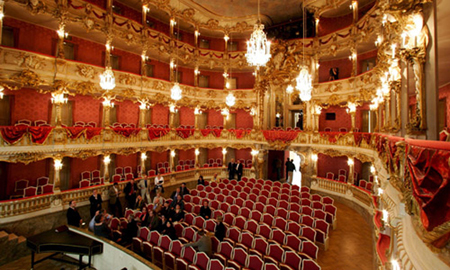 A theater necessarily presents a different appearance than a ceremonial hall, thanks to the presence of many seats in one room, the box seats, the graduated staircases, etc. The practical purpose that as many visitors as possible should be able to see and hear what is happening on the stage dictates many tasks from the very outset. But the beauty does not depend on the immanent technical perfection with which these tasks are fulfilled, but on purely architectural factors. The expression of festivity that is essential to a theater must be realized. This requirement of the spiritual theme can be achieved only by means of artistic factors. In the case of a residential house, the perfect execution of the purely practical living conditions certainly does not guarantee that it will possess artistic value, since a residence should not only serve practical needs. Rather its real theme entails being a worthy place for our intellectual and affective life: in a word, for our life as human beings. And this can be achieved only through the artistic beauty that elevates and nourishes the spirit. Architectural beauty also elevates the whole of our practical life and fills it with the poetry of life. But a residence must not only be architecturally successful, in general terms, and beautiful. It must also possess a tone that accords with the lifestyle of the person in question, from a simple, beautiful building to a palace. In those buildings that serve purely practical purposes, in which the practical activities have been robbed of their poetry—buildings that are mechanized and depersonalized—technical perfection and pure functionality have nothing to do with artistic beauty. Railway stations and factories do not offer any artistic stimulus in their real theme. At most they can be built in such a way that they do not have an artistically negative effect. It is a very stupid argument to say that railway stations were uglier in the past because they were built not like railway stations, but like castles. Their ugliness and tastelessness were not based on the discrepancy between the purely pragmatic purpose of a railway station and the technical atmosphere of what went on there, on the one hand, and the castle-like architecture, on the other. The castles that were built at that period display the same tastelessness, which is a consequence of purely artistic, architectural mistakes. The discrepancy between a purely technical purpose and an architecture that is suitable to a castle is certainly a mistake, but it is not this mistake that makes the building tasteless. Rather it is impossible to erect a beautiful building that corresponds to the sober, neutralized atmosphere of a railway station. If one wishes to achieve congruence between the practical purpose and the architectural character, then the building can at best avoid being ugly. But it is not desirable that it should emanate a completely neutral atmosphere. Independently of its purpose, it can have something monumental and noble, thanks to architectural factors alone. In any case, such a modest architectural value raises it above something that just emanates the world of a railway station. This is even truer of factories and department stores. What happens in a railway station still has a relatively large amount of the poetry of life. How many great moments of human life take place there: the delight at reunion with someone, the painful farewell, the joyful expectancy at the start of a beautiful journey, the joy at arriving in a beautiful place that one does not know or that one longs to see again! Tolstoy has a fascinating description in his novel Anna Karenina of the atmosphere of a railway station and of a train travelling from Moscow to Petersburg. In the past locomotives had a certain charm. The very act of traveling through many different regions, the whistling of the train, and the echo from the mountains had a certain poetry of life. This is lacking in a factory, a filling station, or a department store, where the neutral, depersonalized rhythm of life is much stronger. It is foolish to make an ideal of constructing buildings that emanate this barrenness and that therefore are an expression that corresponds to the purpose of the buildings. It is much more important that these buildings should still emanate a certain architectural nobility and should not have a negative impact on the city in its architectural beauty. It is absurd to believe that it is untruthful when such a building, instead of emanating this barrenness, possesses beauty (no doubt, a very modest beauty) simply on the basis of its form and proportions, its materials and its color. 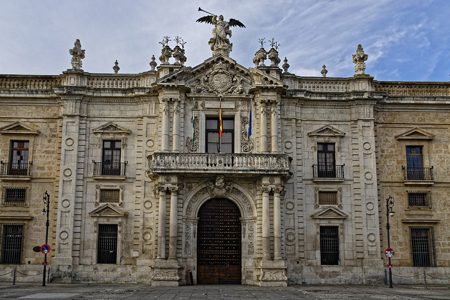 One regrets most profoundly that the beautiful palace of the Fabrica de Tabacos in Seville now serves a commercial purpose; but it does not cease to be beautiful, since as an expression it does not correspond to what is now its practical purpose. It would certainly be inappropriate to erect such a building explicitly for a factory. And yet this example shows how independent architectural beauty is of congruence with the purely practical purpose. In the case of buildings that are newly erected for such purposes, one should not aim at an expression that corresponds to a completely different purpose; nor should one aim at a barren atmosphere that is appropriate to the purely neutral, depoeticized purpose. A modest, simple, but noble architecture is appropriate here, an architecture that in its expression and its atmosphere does justice to the fact that human beings work in these buildings: human beings who are destined objectively for a rich interpersonal and nonmechanized world full of the poetry of human life. We began by pointing out that architecture is clearly distinct from all the other arts in virtue of the fact that it belongs to the concrete world that surrounds us and to the full reality in which we live and move, whereas all the other arts are a world of their own and have their own kind of existence. This very important element makes possible the close link between architecture and nature, a “marriage” analogous to the one formed by sound and word. At the same time, it has a dimension of delightfulness that the other arts lack. 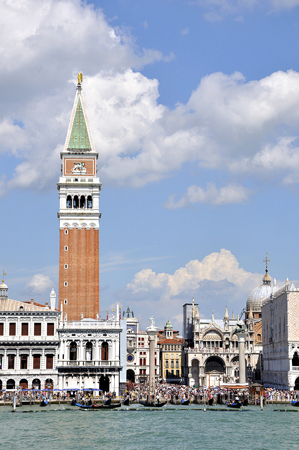 We see this clearly when we walk through a city like Florence or Siena, or stand in Saint Mark’s Square in Venice. The splendor, the nobility, the genuineness of the Palazzo Vecchio or of Orsanmichele in Florence shines forth from structures that are real—just as real as the hills of Fiesole and Monte Morello. They are parts of the world that really surrounds us and in which we live. This fact has an extraordinary ability to delight us. It signifies a new dimension of contact with this beauty. 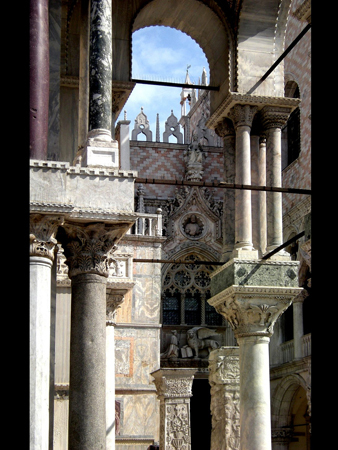 When we look at the Church of San Marco and the Palace of the Doges, we can scarcely grasp that what stands before us is reality. This irruption of beauty into the world in which we live is a tremendous gift, similar to the beauty of a great and significant landscape. Nature too has this dimension of delightfulness. Its bearers of beauty are real entities; trees, animals, brooks, and rocks belong to the full reality of the external world around us. The landscape, the composition of these entities, is likewise a part of this reality. We have already written2 about the role of the reality of the beautiful in nature and about the difference between a glorious chain of mountains and a conglomeration of clouds that looks like a mountain range. This applies to architecture as well. One could object that while the reality of architecture is an important factor for the delight we receive from its beauty, this being delighted is something subjective in its importance for us. It is not a factor for its objective value. To this, we must reply that the new dimension of being delighted is not a purely subjective experience. Being delighted certainly presupposes a person; it unfolds in the spirit of a person. Nevertheless, it is not an arbitrary, subjective experience, but something that is objectively grounded. Secondly, the experience of being delighted also serves to shed light on the completely objective characteristic of architecture. The value quality of beauty is of course not dependent on it; a real building is in one sense not more beautiful than a sketch that is not realized. We see the sketch and apprehend the beauty of the building; we also regret that it was not erected as a building. Becoming real is the bearer of a high value, not only because of the artistic importance of this building for a square, a street, and the entire surrounding area, but also because of the full realization of this bearer of beauty. This full realization is an eminent value. We mention the unique dimension of delightfulness in architecture, which it shares with nature, because it sheds a light on the high value that architecture possesses in the sphere of full reality. It is obvious that we do not refer here to the value that the fully realized work of art possesses over against the potential work of art, the opera that is staged over against the score, or the drama that is staged over against the drama that exists only in print. Rather we have in mind the fact that architecture is a part of the reality in which our real life takes place and to which we ourselves belong. This fact objectively distinguishes architecture from the other arts and gives it a special character. It gives architecture unique possibilities of having an impact, and it is the bearer of a value of its own. This does not indeed intensify the beauty of the architecture, but it is a definite value. Part One of this article appeared in Sacred Architecture 29. Dietrich von Hildebrand was born in 1889 in Florence, the son of Adolf von Hildebrand, an eminent German sculptor of the late nineteenth century. He grew up immersed in the art and beauty of Florence. He studied philosophy with Edmund Husserl and became an important figure in the world of early phenomenology. Given his upbringing in Florence and his training in phenomenology, he was predestined to do original work in aesthetics. Though Dietrich von Hildebrand is mainly known in the Catholic world for his religious writings, such as Transformation in Christ, and for his philosophical writings, such as Ethics, he has yet to be discovered as the important aesthetician that he is. Rev. Brian McNeil, C.R.V. was born in Scotland in 1952. After studies at Cambridge, he entered the Canons Regular of Saint Augustine and was ordained to the priesthood in 1985. He has worked in parishes in Italy, Norway, and Germany, and is presently pastor of a large parish in Munich. He began translating for the English-language edition of the Vatican newspaper in the 1980s, and has translated sixty books and numerous articles. John F. Crosby is a professor of philosophy at Franciscan University of Steubenville and is a Senior Fellow of the Dietrich von Hildebrand Project. He was a student of Dietrich von Hildebrand. We present here a selection from his Aesthetics, which is about to appear in the newly formed press of the Hildebrand Project (www.hildebrandproject.org). The Hildebrand Project exists to bring all of von Hildebrand’s works into English and into print, and above all to bring them into intellectual circulation. 1. Dietrich von Hildebrand, Aesthetics, vol. 2, chap. 6, abridged and edited, trans. Brian McNeil and John F. Crosby (Hildebrand Project, forthcoming 2016). The translation and publication of the Aesthetics was made possible through the generosity of Howard and Roberta Ahmanson together with Dana Gioia and the National Endowment for the Arts, the Cushman Foundation, and the Budnik Family Foundation. 2. Aesthetics, vol. 1, chap. 14.